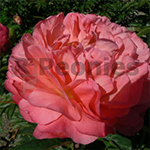 This cultivar is special because of the fading colours from orange-coral to pink-apricot to soft yellow and finally creamy white. If matching color is your game this variety might be difficult to use. Large heads with semi double flowers. The older the plant the more rows of petals. Very thick and sturdy stems are good for buds and flowers. APS Gold medal in 2003. The favourite Peony for lots of people.